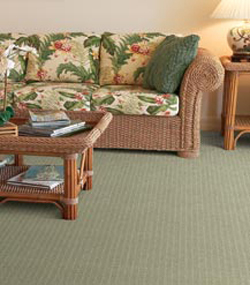 Dixie Home offers an array of high fashion, trendsetting, broadloom residential products. These highly differential products use premium yarns and offer the consumer above average styles and performance. Visible loops of yarn form the surface of the carpet. Loop pile is also known as “uncut.” Loops are produced by driving yarn through one side of the carpet backing on a needle and pulling it back through. Left uncut, this pile is called loop. Examples of loop pile styles include Berber, Cable, and Sisal carpet styles. All yarn ends on the surface of the carpet are either cut or uncut. A carpet that has a combination of the two is a cut/uncut or a cut/loop. Whether the styling in multi-level or tip-sheared, cut/uncut products offer added textural interest. When the surface of the carpet looks curly or nubby, it’s called a frieze. This type of cut pile features yarn that is very tightly twisted, which provides enhanced styling and performance characteristics. A saxony carpet has a smooth, level finish in which all the yarn ends are cut at the same level after they have been tufted. This elegant surface type may be considered more formal than other styles. Other names for saxony include velvet, plush, and cut pile. A carpet may be called ‘textured’ when the increased amount of yarn twist gives the surface a rough or slightly nubby appearance. The yarn in the textured pile may be crimped as well as twisted to produce color shadings that enhance appearance. ‘Texture’ also describes any combination of cut and loop piles and differing pile heights, designed to provide more attractive and more durable carpets.